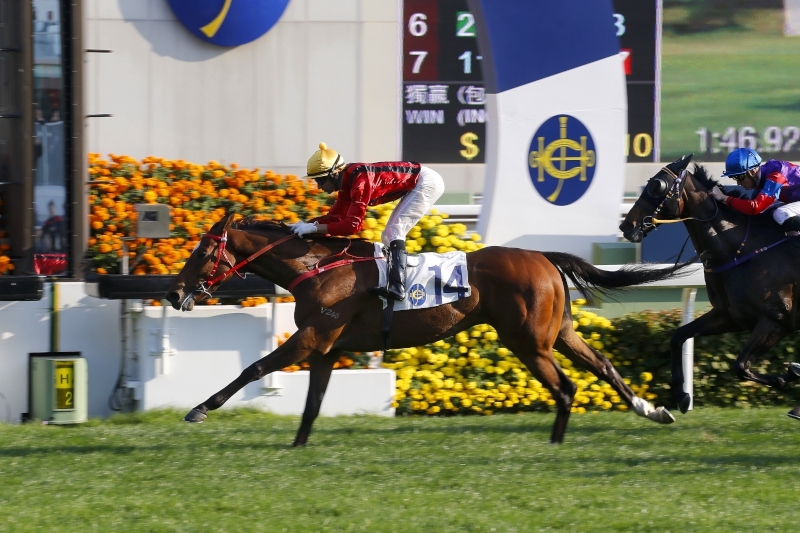 John Size heads into Sunday’s (19 March) BMW Hong Kong Derby (2000m) triple-handed as he looks to nick a third win in the HK$18 million race, but the champion trainer is under no illusions as to the task facing Prawn Baba, Dinozzo and My Darling. “I think Rapper Dragon, Pakistan Star and Beauty Generation are the horses to beat, they’ve all been solid, their form has been very good, their previous experience has been good, so I think the winner will come out of the top three,” he said. With Rapper Dragon top-rated on 114, each of Size’s trio has some ground to make up. Prawn Baba, one of Joao Moreira’s “Magic Eight” at Sha Tin two weeks ago has a rating 20lb below the likely favourite, his current mark being a career peak 94, while My Darling is rated 91 and Dinozzo 90. Prawn Baba completes Joao Moreira’s eight-timer in a Class 2 1800m event two weeks ago. “I think that luck in running and how they run the races is always the way you sort out these horses that aren’t actually rated to win, but they are good enough to get some prize money, so we hope they can,” the trainer said. He has won the race previously with Fay Fay (2012) and Luger (2015). And in the Craig Williams-ridden Prawn Baba, a place-getter over 2200m at Happy Valley in December, and Dinozzo, a close second at the course and distance, Size has two gallopers that should relish the mile and a quarter test. Prawn Baba’s last start win, his first in Hong Kong, was achieved at 1800m and the Duke Of Marmalade gelding, out of a Second Empire mare, has the look of a genuine stayer. “Prawn Baba’s win last time was strong, I think the 2000m will probably help him a little bit, he ran a very fast time the other day although it was a firmer surface. But he was still able to do it and it was a strong win. He seems to have a fair bit of stamina so I’d expect him to run a big race,” Size said. And Dinozzo, with two 1800m wins and that 2000m second on his record from six local starts, is another that should relish the trip. 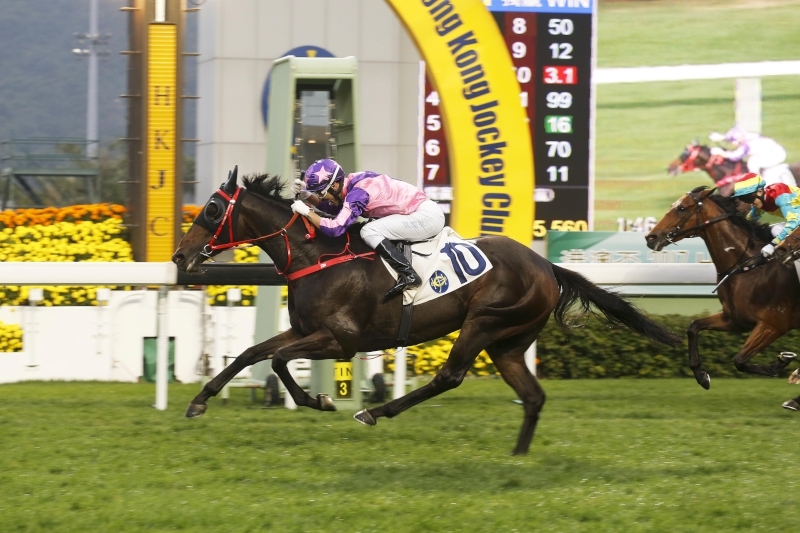 The Lilbourne Lad gelding, however, must step up on his seventh behind Rapper Dragon in last month’s Hong Kong Classic Cup (1800m). Hugh Bowman is booked to ride. Dinozzo coasts to victory over 1800m two starts back. “Dinozzo looks like a stayer, a fairly strong stayer in the event; he looks like he wants more ground and runs on strongly. If it turns into that type of race, and it is run to suit him, he’s going to run well,” Size opined. My Darling, on the other hand, is a doubtful stayer at the trip, according to Size, who believes a steady pace would suit the Karis Teetan-ridden Mossman gelding. “My Darling would be doubtful at running 2000m it seems but there doesn’t seem to be a lot of speed in the race or pressure, so if he doesn’t lead the race, he’ll be very close to it. I wouldn’t expect a fast-run race so that might help his cause,” he said. My Darling scores his fourth career win earlier this season. The BMW Hong Kong Derby also features Classic Cup runner-up Pakistan Star from the Tony Cruz stable, as well as the Danny Shum-trained Seasons Bloom, third in that race and second to Rapper Dragon in the Classic Mile. Eagle Way, Gold Mount, Limitless, Booming Delight, Helene Charisma, Rodrico and Circuit Hassler complete the exciting line-up. The BMW Hong Kong Derby is due off at 4.35pm. The 10-race card commences with the Class 4 Helene Mascot Handicap (1200m) at 1pm.